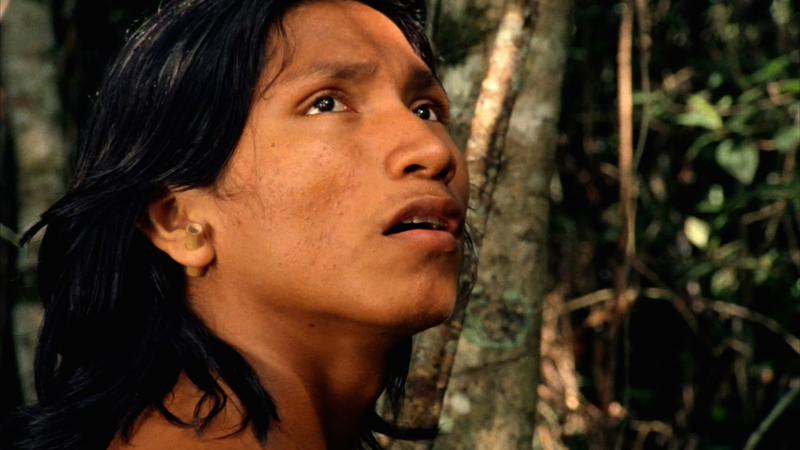 In short: The beautiful and melancholy portrayal of a 15-year-old indigenous Krahô at a crossroads between an anxious and restraining shamanic calling and the industrialised world’s false promises of freedom. The title of Renée Nader Messora and João Salaviza’s film “The Dead and The Others” (a liberal translation of the original Portuguese title “Chuva é Cantoria na Aldeia dos Mortos”, which could translate as “Rain and Chants in the Village of the Dead”) could suggest another Zombie-infested action film, but with its long, natural takes and its slow pace (and fair to say, the absence of “walkers”) the film is quite the opposite. “The Dead and The Others” explores the difficulties of being indigenous in Brazil today and what it’s like to be stuck between ancestral tradition and a modern, unwelcoming industrialised world. This beautiful story is technically classed as documentary which is informed by Nader Messora’s experience of living and working with Krahô people in Pedra Branca, a village located in the Cerrado, a tropical region in the centre and North of Brazil. Since 2009 she has worked with indigenous people to use film as tool to assert and defend their cultural identity. The film illustrates the deep connection of indigenous tribes with natural elements and how they form a virtuous eco-system, in stark opposition with the western lifestyle that takes resources from nature but doesn’t give back. The non-professional actors, all Krahôs, illustrate the village life through their everyday tasks and activities, which culminate in an all-night ceremony marking the end of Ihjãc’s father’s mourning, with fascinating rituals and chants. With limited dialogue, apart from Ihjãc’s conversations with his wife and shaman, it’s sometimes hard for the viewer to really grasp the villagers’ ethos, motives and aspirations. There is a short, light-hearted scene where young women discuss their tastes in men, which in a way describes the universal laws of attraction. The soundtrack is dominated by the mesmerising, buzzing tropical forest noise. The lulling pace of the film is set by the cicadas, birds and other hissing insects that populate the surrounding and are a constant reminder that this is a place where thousands of species cohabit. There is little incursion of the industrialised world in Pedra Branca, other than the manufactured clothes some villagers wear, but not far away, looming, is the modern city with its pickups vans, dirty trucks, concrete and drugstores. A real sense of duality permeates the film as the village and town are geographically close but culturally worlds apart, and that’s what is most troubling to Ihjãc. Even if he wanted to find his place in the westernised Brazilian town he would always be treated as second-class citizen. Despite the white population’s moral obligation to care for and respect autochthones, public authorities are clearly only paying lip service to protect indigenous land. The film is visually striking thanks to the sheer natural beauty of the forest which becomes the leading part in the story. Here and there, Nader Messora and Salaviza have added elements of fantasy to communicate the spiritual presences that Ihjãc and the village shaman are witnessing. There is a particularly beautiful scene at the beginning of the film where a waterfall is set alight. At other times threatening images of parrots pop up. But overall the directors’ choice has been not to overdo special effects and focus on a naturalistic documentary style, although this could have perhaps helped the viewer engage more with the spiritual dimension of the film. Although with a different premise, this was perhaps better achieved in the Embrace of the Serpent by Ciro Guerra (2015, Columbia) which beautifully told the story of a mysterious Amazonian shaman in search for a magical plant.